It has being long since I last baked a chiffon cake for my family. Although previously I have baked a few Chiffon Cakes(recipes HERE) but I still have in mind that chiffon cake is rather complicated and not easy to achieve it's unique light and fluffy texture. And moreover, sometime I find chiffon cake batter is quite difficult to handle due to the whisking of egg white(to stiff peak), mixing of yolk batter with whites and even after baking the cake itself might collapse or have wet texture due to oven temperature of baking time. 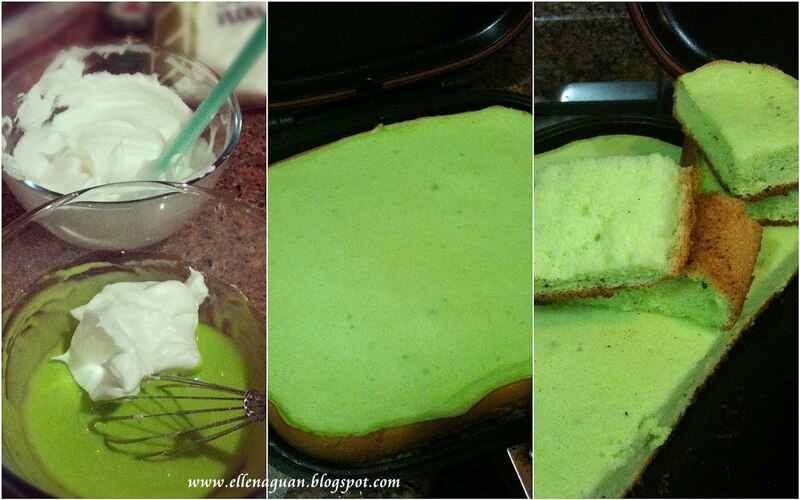 Here with my amazing Happy Call Pan(韩国双面锅), I decided to challenge to another level by using it to make Chiffon Cake. Although most of the Happy Call Pan (HCP) members used Prima Flour - Pandan Chiffon Cake Mix (available in most supermarkets) to make chiffon cake but I find the amount eggs required are too much for my liking and also since I have most of the ingredients in my pantry I decided to make it from scratch instead of using pre-mix flour. So far I have made two chiffon cakes using HCP and as you can see from the photo, even though the cake might now raise as tall as in height compared to the usual chiffon cake but we simply loves it's light and fluffy texture which how amazing it could be done by HCP. For your information this lovely chiffon is ready within 30 minutes of baking time too. Chinese version of this recipe available HERE. 1. Beat egg yolks and 25g caster sugar using an electric beater till pale and creamy (about 3 minutes on medium speed). 2. Stir in oil, coconut milk and sifted flours(cake flour, cocoa powder and baking powder) till combined before mixing in the water and chocolate chips. Set aside. 3. Next using a clean beater, whisk egg whites and cream of tartar in another bowl till foamy before adding in the sugar in 2 - 3 batches and continue to whisk till stiff peak(when the bowl turns over the whites remains without falling off). 6. Lastly, flip the HCP over and bake for another 6 minutes(3 minutes left, 3 minutes right) to have a nice brown top. For baking using Jumbo Pan, you can use x 1.5 of the above recipe. 1. Follow steps 1 - 4, pour cake batter into a 14cm (7") chiffon pan. 2. Bake in preheated 160° Celsius oven for about 40 minutes or when a skewer inserted in the center and comes out clean. 3. Remove pan from oven and invert the pan immediately to let it rest on top of a cup. Make sure it cool completely before unmould. 4. To remove the cake from the pan, run a thin-bladed knife(i use a small rubber spatula) around the inside of the pan and the center core then follow by the base of the pan before removing the whole cake. This is the 1st Chiffon Cake I experiment using HCP and I am happy with the result as compared to the usual chiffon cake that I used to bake. For this recipe it required 3 Egg Yolks and 4 Whites from eggs that weight 60g each. And from the photo above you can also see that although this Pandan Chiffon Cake is bake using HCP but it still has it's unique brown crust like those usual one that we bought off self or bake from the oven. 1. 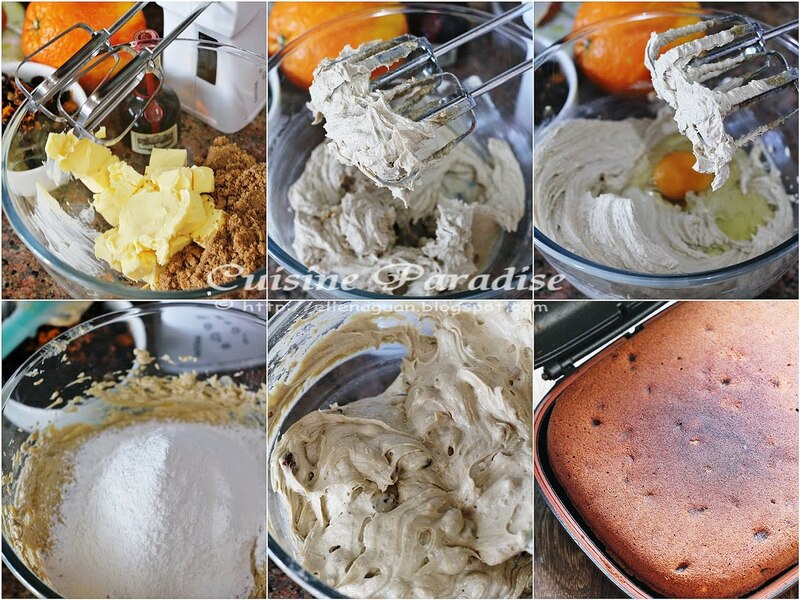 Follow the same steps as above shown in the Chocolate Chiffon Cake. 2. Mix pandan paste with 2 tablespoons of water and add it into steps 2 shown above. 3. You can blend about 20 pieces of Pandan leaves(Screwpine) and extract fresh juice from it. Recipe HERE. This recipe is pretty simple and straight forward to follow so you can even bake it with your kids during weekend like what I did with my boy. I am sure this would be a good family activities to add extra bonding and fun time before tea-snack. Feel free to explore this recipe with your own preference by adding or different ingredients such as dried fruits, sweet potato, corns and etc to make different flavour of your family favourite chiffon cakes. Till then have a great weekend, everyone! Lately there is a soy milk beancurd craze in Munch Ministry facebook page where some of the members shared and upload their homemade beancurd pudding. I really admired those ladies with innovative ideas in creating different types of flavour from the original recipes. And you just can't imagine how easy it is to make your own soy milk pudding with just 3 ingredients. This type of Soy Milk Beancurd Pudding is different from the traditional soy milk beancurd that we used to purchase from the hawker center, foodcourt or Mr Bean. The recipe below is quite close to the popular "Lao Ban (老伴豆花)" beancurd pudding which has branches located at Old Airport Road and Maxwell Market. Although there are quite a few version of this beancurd pudding recipes when you do a Google search. But if you want to read up for some information and try out different methods to suit your taste buds, you can read up more details over at Anncoo's "Soya Bean Beancurd Pudding" and Misstamchiak's "Best Chilled Beancurd Pudding Recipe" where they used instant jelly powder instead of gelatine stated in the recipe shown below. 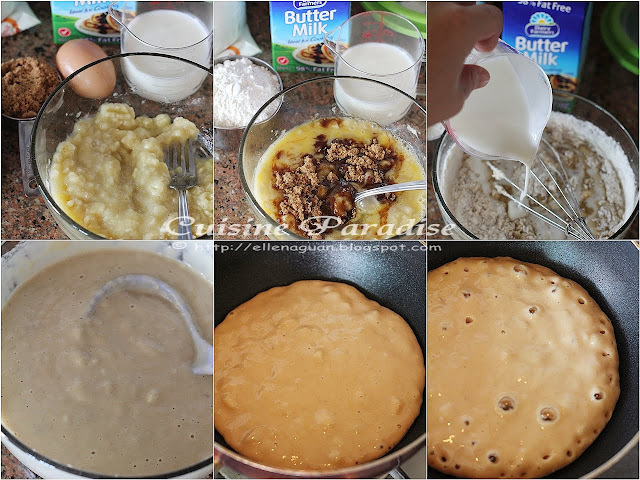 I have tried a a few combination on this recipe by either omitting the creamer or reduce the amount of gelatine used in order to find a perfect texture that suits our liking. So after a few experiment, we preferred those that is without creamer as we find the taste is already good enough even without the additional creamer. Whereas I also reduce the amount of gelatine from the original 2.5 teaspoons to 2 teaspoons as we prefer a wobbly and melt in mouth texture type of beancurd pudding. So it's all up to individual to twist and swap with the ingredients to make something that suits their preference. Recipe adapted from Munch Ministry, Soft and Tender Chilled Beancurd, HERE. 1. Heat up Vitasoy/Soy bean milk in a saucepan over low heat(do not let it boil). 3. Next pour the gelatine mixture into the remaining warm soy milk, stir stir in creamer if using and let it simmer for another 30 seconds(careful not to let it boil). 4. Off the heat. Let mixture cool off slightly before sieving it into prepared containers to cool completely. 5. Chilled mixture for at least 3 - 4 hours in the fridge before serving. When compared the above Vitasoy version with this Black Soy Milk Pudding, I personally prefer the taste and texture of the latest as I felt 2 teaspoons of gelatine work well with 500ml of soy milk to give that wobbly and smooth texture that I am looking for. ~ Refer to the steps above on the "Soy Milk Beancurd Pudding". So if you are a fan that likes smooth and silky beancurd pudding such as those from "Lao Ban (老伴豆花)" or 51 Soya Bean then perhaps you could gather these easy ingredients to make your own beancurd puddings at home. Cheers! Nothing beats a slice of fragrant Butter Cake which is infused with lemon aroma together with bits of bursting blueberries in your mouth. To be honest, among all the different types of tea-cake, I simply adore butter cake especially those that are lightly infused with lemon fragrant. 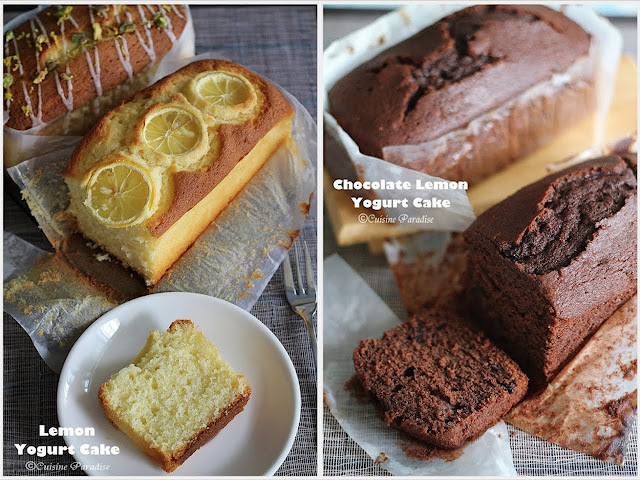 If you still remember, a few months back I have shared two recipes on these "Lemon Yoghurt Butter Cake" and "Chocolate Yoghurt Butter Cake" which is a hit for our family and friends. We love both version of the cake despite of either plain or chocolate. From a glance at the supermarket dairy section you would see many different varieties of Yoghurt from either plain to those with fruit flavour and toppings such as jam, nuts and etc. Yoghurt is so wholesome and yet easy to make without any secret in the recipe. So with a foolproof recipe anyone can start making their own yoghurt at home. Just for a note, the bacteria used to make yogurt are known as "yogurt cultures" and from fermentation of lactose, these bacteria produces lactic acid which acts on milk protein to give yogurt its creamy texture and characteristic. I used to make yoghurt years back when my boy was around 8 months old during the period when he started mashed food and puree. And I still remember his favourite choice are "Yogurt with Peach and Banana" and "Yogurt with Mashed Avocado". A few months back after a brunch treat over at Sherie's (maameemoomoo a 1/2 food blog) house where she prepared her yummy Banana Pancakes and irresistible homemade yoghurt(stay tune for her recipe too) for us, I can't held thinking about it till I started making homemade Yoghurt again. 1. Heat the milk over low heat, stirring gently until bubbles and steam begin to appear on the surface (82°C), remove from heat. 3. Scoop about 1 tablespoon of the yoghurt cultures in a bowl, add in about 50ml of the lukewarm milk and mix well. Next pour the mixture back into the remaining milk and stir well. 4. Next pour the cultured milk into a clean sterilized glass jar or any non-reactive container and cover the lid on. 6. 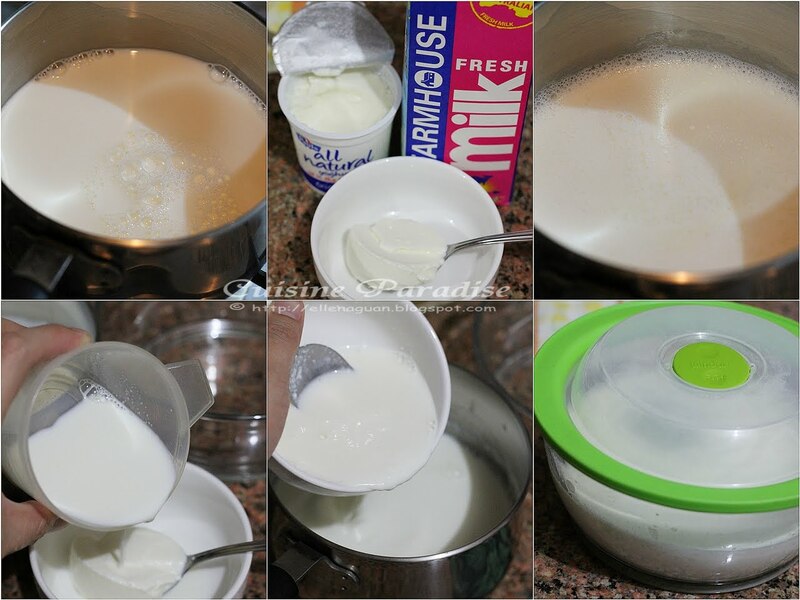 Put the jar in the refrigerator immediately to slow down fermentation and as well as firm the texture of the yoghurt. It will last for about 1 - 2 weeks in the fridge. These are some of the plain yoghurts that are available in major supermarkets. There are so many ways you can enjoy the wholesome goodness of homemade yoghurt such as eating it plain on it's own or drizzle with of Honey or Gula Melaka Syrup to sweeten its taste. If you want something more cafe style or with bits of crunch, you could also add in cut fruits or Muesli like what I did from the photos shown above. ~ Do not add in the live yoghurt cultures if the warm milk is above 42°C or else the heat will killed the live cultures and effect the texture and overall result of the homemade yoghurt. ~ Different brands of plain yoghurt might produce different results so you have to take note and check the labels to ensure they contain yoghurt making bacteria such as Lactobacillus aci-dophilus, Streptococcus thermophilus. To make something more impressive for your guests, you could served it with some quick fruit compote on the homemade yoghurt. Here is a quick recipe on 5 minutes Blueberry Compote. Follow from the previous Double Chocolate Banana Cake post, here is the related post on a simple Mixed Fruit Cake which I made especially for Uncle James as he is a big fan of mixed fruit cake. And since I am baking two cakes on the same day using Happy Call Double-sided Pressure Pan (HCP) for demonstration to my aunties; who are all keen in learning how to bake using this new gadget, I have modify the usual traditional fruit cakes recipes to a simplify one. Compared to the traditional Christmas Mixed Fruit Cake, this one is much easier in term of ingredients preparation and shorter baking time.You can prepared ahead by soaking the mixed fruit with RUM and orange juice the night before to achieve a better flavour or if you are running out of time like me, just make sure you have soaked them at least 10 - 15 minutes. Here I have adapted a similar recipe from the previous Banana Chocolate Cake with Cranberry which I have shared. And instead of using caster sugar, I have replaced it with brown sugar for its natural brown and taste that enhance the appearance and taste of the mixed fruit cake. As for the type of dried fruit you can either purchase those ready-mixed packed available from baking section or you can DIY your own by mixing a few of your favourite fruits such as tangerine peel, apricot, raisin, cherry, ginger and etc together. 1. Soak dried mixed fruit with RUM, Orange Juice and Rind for about 10 minutes. Sift together flour, baking powder, baking soda and salt together in a bowl and set aside. 2. Cream soft butter and brown sugar using a electric beater or hand whisk till pale and creamy. 3. Add one egg at a time, beat till combined before adding in the flour mixture. 4. Using a spatula, fold in sifted flours in 3 batches alternatively with the mixed fruit mixture(add in the liquid as well) till well combined. 5. Slowly scrap mixture into the lightly greased Happy Call Pan(grease 1 teaspoon of oil on both side of the pan using hand or paper towel). 7. Lastly, flip the HCP over and bake for another 6 minutes(3 minutes left, 3 minutes right) to have a nice brown top. 1. 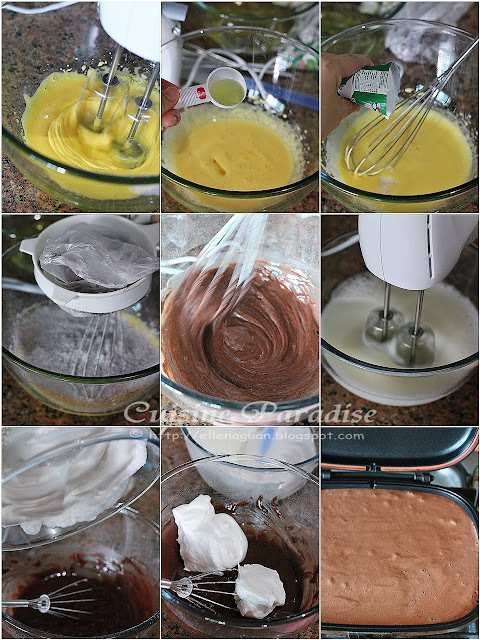 Follow steps 1 - 4, pour cake batter into a greased 7" square or round tin. 2. Bake in preheated 180° Celsius oven for about 40 - 50 minutes or when a skewer inserted in the center and comes out clean. This is another snack preview of my HCP bake cake; Blueberry Lemon Butter Cake made using fresh blueberry. Simply love this light and fluffy lemon taste cake with my favourite blueberry in it. Will update more on the related recipe soon. Stay tune. Even though I might appear to be cooking often over at my recipe blog, I do have time where I just wanted to have some quick and easy meal while enjoying ME TIME watching my favourite TV programs or etc. Hence in order to have some ready meals that resemble home-style cooking, often I would pick up a few varieties of CP Ready Meal from the supermarkets. 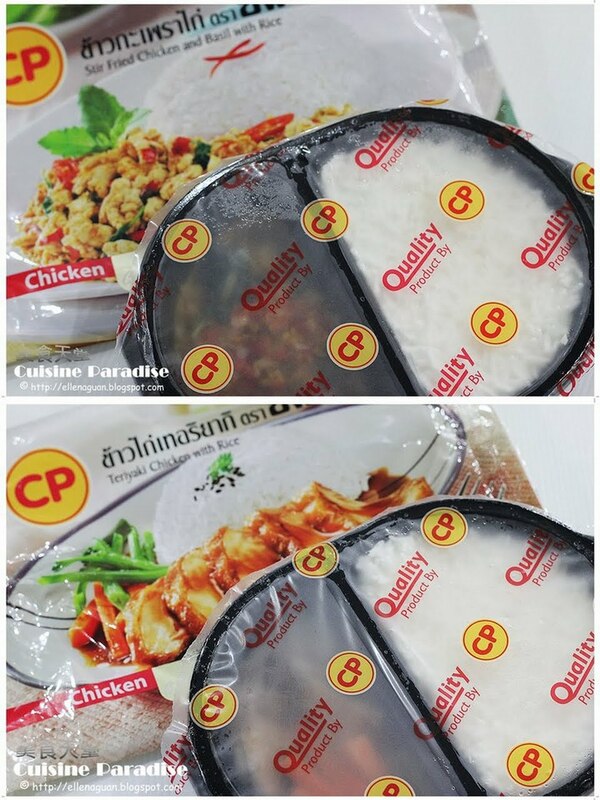 As we know, CP ready Meal is with no preservatives added and they are ready for consumption just by simply popping the package into the microwave and cook for about 4 - 5 minutes. So for a chance from the usual hawker food, sometime we do enjoy having this quick dish especially during raining day or supper time. This is the new CP Chicken Green Curry With Rice which Thai food lover can now enjoy their favourite green curry anytime of the day with minimal fuss. This dish is prepared in an authentic home-cooked style with generous chunks of tender chicken meat, eggplants and fragrant Jasmine rice. 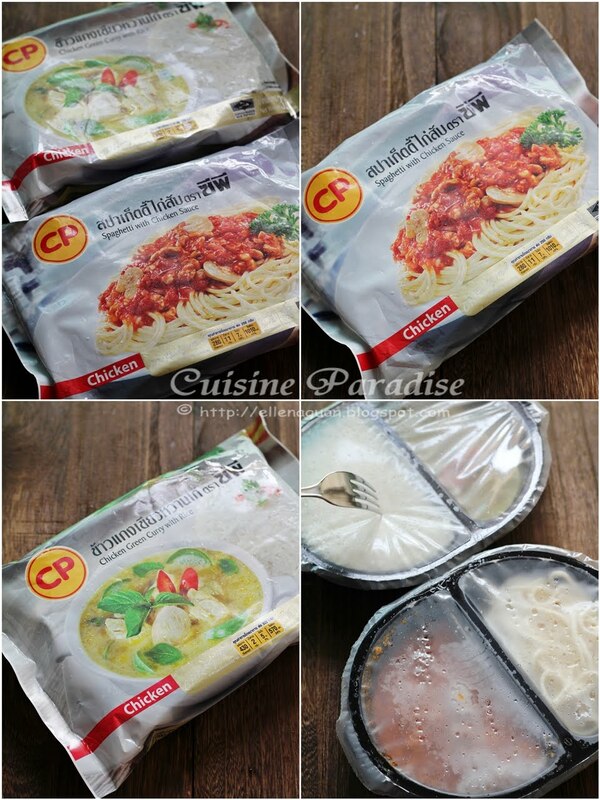 Although this "ready meal" cannot be compared with served in Thai restaurant but for the retail price at S$4.50, this could be something that you would like to stock-up in freezer for a hearty quick lunch/supper. 1. Remove the outer wrapper before reheating. 2. Using a fork, pierce the clear film on the food container for 3 - 4 times. 3. Cook in microwave for 3.5 minutes at 1,300 watt or 5 minutes at 800 watt. ~ You do not need to defrost item before cooking. If you prefer noodles than rice, perhaps you can try their hearty spaghetti. CP Spaghetti with Chicken Sauce will satisfy your palate with delicious al dente spaghetti enriched with flavorsome tomato-based sauce which includes lean minced chicken. I love the way it separate the sauce and noodles so as the texture of the noodles would not be affected by the sauce and we also can mix in the sauce base on our preference. Other than this two new products mentioned above, there is also "Teriyaki Chicken with Rice" and "Stir-fried Chicken and Basil with Rice" all available at major supermarkets, Cheers or 7-11 outlets. Since this week is the March School Holiday break, I have more control over the timing and presentation while preparing our lunch menu. Here we have something different from our usual school day lunch where I spent an extra 15 minutes plating up the dish in cute lunchbox with appealing decorations. I think most of the kids might not like green vegetables, sweetcorn or even root vegetables such as carrot or onion. So in order to get kid's enjoy their meal, as a parent we can make something appealing for their eyes using simple tools and decorations. With a flower food cutter and cute food picks I managed to come out with this quick and simple lunchbox which I am sure even the adults can't resists having some for themselves too. This Caramel Chicken with Potato dish is one of our family all-time favourite. It was infused with sweet and savory taste from the sauce and it's definitely perfect for a one dish meal. I was first introduce to this dish by one of my neighbour, Tarron during my stay in Brisbane many years back. Instead of using sugar which is normal called in most Caramel Chicken recipe, here we are using Sweet Soy Sauce which is also known as "Kecap Manis" to sweeten the dish as well as giving it an unique fragrant and taste. Although this dish might not look good as it is due to it's colour but I can assured you that you would love it's delicious sauce and taste which makes you having at least 2 bowl of rice to go with this dish. 1. Trim and clean the chicken, pat dry and marinated it with 1 teaspoon of cornflour, light and dark soy sauce, ground pepper for at least 15 minutes before cooking time. 2. Lightly coat the potato strips with some cornflour and fry it with 1 teaspoon of oil till slightly golden brown, remove and set aside. 3. Heat up 1.5 tablespoons of sesame oil over medium low heat, saute ginger, garlic, onion, spring onion and dried chilli(soak in hot water to soften, remove seeds before use) till fragrant. 4. 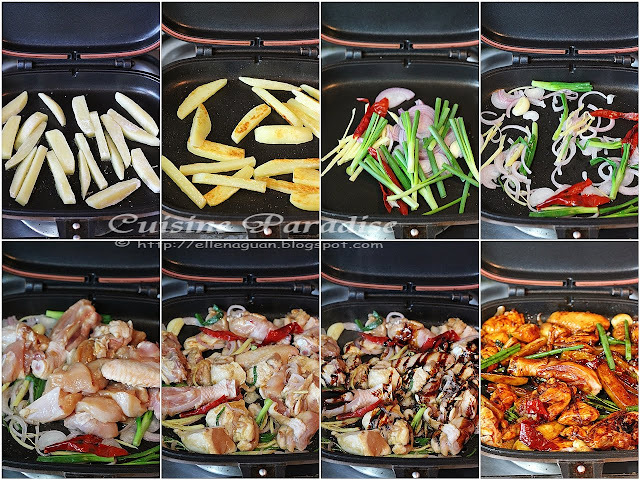 Add in chicken pieces and stir-fry until slightly golden in colour, stir in sweet and light soy sauce, return potatoes into pan, covered and cook for about 8 minutes with Happy Call Pan(pan locked) or until chicken is cooked through. 5. Check the taste and add extra sweet/light soy sauce according to your preference. Cook, stirring, for another 1 minute or until sauce thickens. Serve with steamed rice. ~ You can use 4 chicken Maryland/breast meat for this recipe instead of 1/2 portion of chicken. ~ If you don't have dried chilli, you can replace it with red capsicum or red chilli. Other than this Caramel Chicken dish, I have another similar dish using Sweet Soy Sauce(Kecap Manis) which is known as "Kaffir Lime Leave Chicken". You can read more about this post and it's recipe HERE. 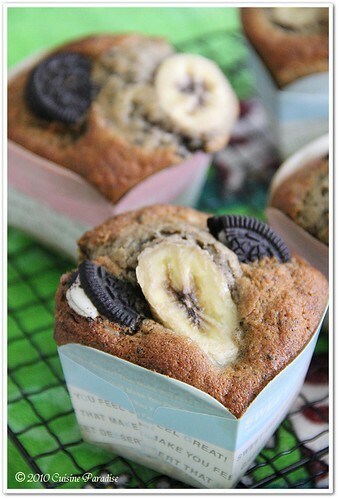 Finally, Sherie posted her recipe last week and now I am able to make this yummy treat on my own whenever I have some extra banana in the pantry. Moreover this recipe also makes a great idea as snack anytime of the day. Recipe adapted from Sherie of Maameemoomoo, HERE. You can refer the steps on making these yummy banana fritters from Sherie's post HERE.